PARKING CAMERA - AIR CON - BLUETOOTH - AUTOMATIC LIGHTS - DIAMOND CUT ALLOY WHEELS - FULL SERVICE HISTORY - ADVISORY FREE MOT - £0 ROAD TAX!! 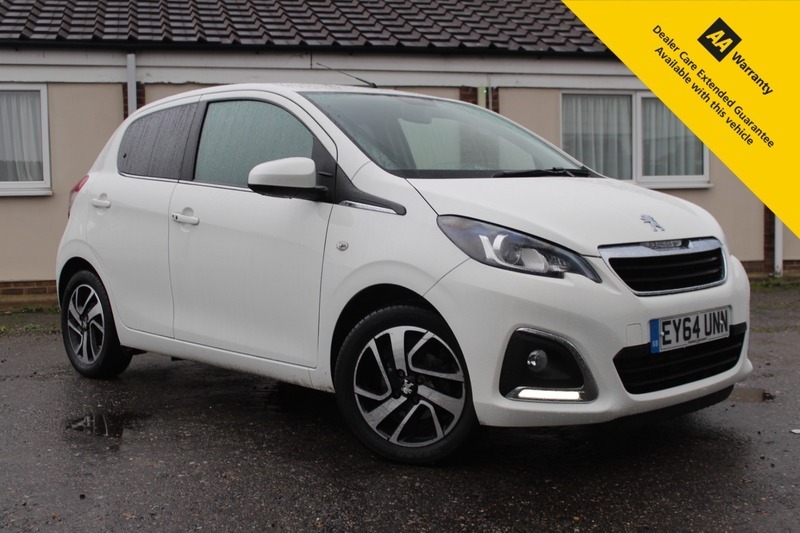 HERE FOR SALE AT LEIGH CARS LTD WE HAVE A SUPERB EXAMPLE OF THE POPULAR PEUGEOT 108 ALLURE 1.2 PETROL. THE ALLURE MODEL COMES WITH A BRILLIANT SPECIFICATION LIST INCLUDING ELECTRIC WINDOWS & MIRRORS, KEYLESS DOOR LOCKS AND START, REAR TINTED WINDOWS, AIR CONDITIONING, BLUETOOTH CONNECTIVITY, REAR PARKING CAMERA, DIAMOND CUT ALLOYS, USB CONNECTION AND AUTOMATIC LIGHTS. THIS FINE EXAMPLE HAS HAD JUST 2 OWNERS FROM NEW AND COMES IN A STRIKING WHITE PAINT AND IS IN BEAUTIFUL CONDITION FOR THE AGE AND THE MILEAGE. THIS CAR COMES WITH A LONG ADVISORY FREE MOT THAT EXPIRES SEPTEMBER 2019 AND A FULLY STAMPED SERVICE HISTORY WITH 3 STAMPS WITH THE LAST ONE BEING DONE BY US ON THE 15/11/2018. THIS CAR WILL COST YOU A TOTAL OF £0 PER YEAR TO TAX AND WILL RETURN YOU AN AVERAGE OF 65.7mpg, SO IS NICE AND ECONOMICAL TO RUN. THIS WILL MAKE AN IDEAL FIRST CAR OR A SECOND FAMILY RUNABOUT, WITH SUCH IMPRESSIVE ECONOMY, FREE ROAD TAX AND LOW INSURANCE BRACKET, WITH BAGS OF SPECIFICATION.... THIS ONE WILL NOT BE HERE LONG SO BE SURE TO BOOK IN YOUR TEST DRIVE TODAY! AS WE ARE AN AA ACCREDITED DEALER, WITH ANY PURCHASE THROUGH LEIGH CARS LTD, YOU WILL ALSO RECEIVE A FREE WARRANTY ALONG WITH 12 MONTHS AA BREAKDOWN ASSISTANCE. WE OFFER VERY COMPETITIVE WARRANTY EXTENSIONS UP TO 24 MONTH AND WE ALSO OFFER VERY COMPETITIVE FINANCE PACKAGES - WHY NOT CHECK OUT OUR FINANCE CALCULATOR ON OUR WEBSITE WHERE YOU CAN TAILOR A PERSONAL QUOTE TO YOURSELF AND EVEN INSTANTLY APPLY FOR FINANCE! WE OFFER PART EXCHANGE AND NATIONWIDE DELIVERY AND WE ALSO OFFER HOME APPOINTMENT SERVICES, SUBJECT TO CONDITIONS. WE HAVE JUST BEEN AWARDED "CAR GURUS TOP RATED DEALER 2018" AND WE ARE RATED 5 STARS BY ALL OF OUR CUSTOMER REVIEWS ON GOOGLE AND AUTOTRADER, SO YOU CAN BE ASSURED YOU ARE DEALING WITH A COMPANY YOU CAN TRUST. QUALITY CARS YOU CAN TRUST. WE ARE OPEN 7 DAYS A WEEK - VIEWING BY APPOINTMENT ONLY.